How would you like a nice green plant thriving in that dim & colorless office of yours or how about adding a touch of modern to your home decor? Here’s a popular option that even the most beginner of green thumbs can make flourish, and it’s believed to bring good luck too! That is Lucky Bamboo. It’s not bamboo! It’s a member of the lily family (Dracaena sanderiana) and grows in rainforests located in parts of Asia. This is favored because it’s so easy to grow and take care of. No need for potting soil, they are happy to grow in just water (Hydroponics). If you have a windowless office, this is one plant you should try–it thrives in both natural and artificial light. Take the stalk and rinse the stem and roots, look for any signs of decay and snip those off. Pinch off any yellow leaves. Fill the container you wish to grow it in with rocks or marbles (or a mixture of both) at least 2″ deep. The container can be anything from a tall glass, a dainty vase or a decorative jar. Place in the container and settle it into the rocks for support. Add room temperature distilled water about 1″ deep. It can be placed anywhere but in direct sunlight, direct heat or chill. You can arrange several together in one container if you wish. You can use tap water instead of distilled but it’s important to let the water sit uncovered for at least 24 hours before allowing the stalks to sit in it, this will help remove the chlorine, fluoride and other minerals from the water (it will suffer from this otherwise). Clear glass containers are popular because you can see the stones or marbles and the fresh water. However, direct light encourages algae growth. If you choose a clear container, be diligent with changing water regularly. If you want less hassle, choose a solid colored container. The disadvantage of this is that you won’t be able to see the rocks or monitor the water quality and amount as easily. You can grow it in soil, but you need a good draining mixture to help it stay healthy. Use a mix of sand, peat moss and soil (equal ratio) and keep it moist rather than sopping wet. Keep the stalk at least 2″ deep. Make sure to have a few drainage holes in the pot as well as shards of pottery or rocks underneath the soil to ensure good drainage. Prevent root rot by allowing the top 1/2″ of the soil to dry out between watering. It needs to have fresh, clean water on a regular basis to prevent bacteria growth. Change it weekly, some suggest even a bi-weekly change is fine. Keep an eye on the water, if it gets murky or cloudy or starts to smell–you know it’s definitely time for a change. When changing the water, inspect the roots and snip any that are starting to decay. Wash the container and the rocks well. Maintain the same level of water each time you fill the container, the water line is where the roots will form. Give it a treat by occasionally misting it with distilled water, this will help the leaves from getting too dry as well as simulate it’s natural habitat. Keep it out of direct sunlight, direct heat and cool drafts. You can trim it to keep it neat and from getting top heavy, but don’t cut the stalk. When doing any trimming or cutting, make sure to use sterile scissors. You can wipe them clean with rubbing alcohol then once dry, use to snip. Trim shoot growth to about an inch from the main stalk. You can occasionally feed with a mild fertilizer (every other month or so). 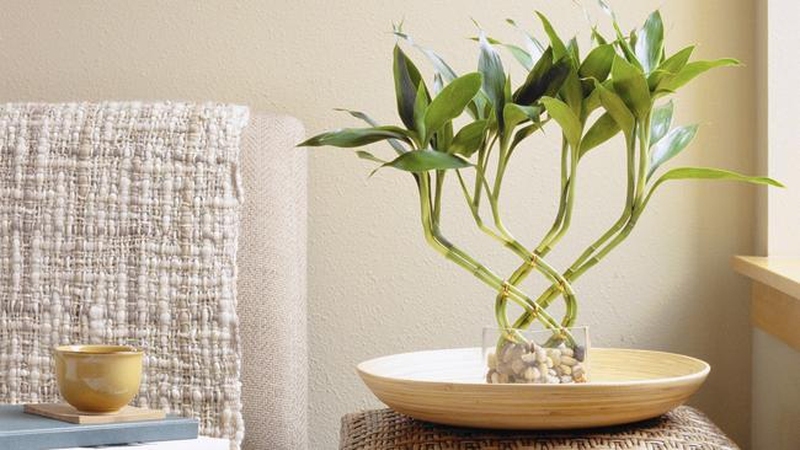 Lucky Bamboo propagates very easily, simply take a cutting that has at least one leaf node and place in a cup of distilled water, new roots should appear after a few weeks. While waiting, make sure to replace the water frequently to keep it clean. Once the roots have appeared and the cutting looks healthy, place it in the container with the other stalks or on it’s own using the instructions above. If you want the main plant to grow another shoot where you cut it, spray the cut daily with water. If you want to prevent growth, apply a bit of melted paraffin wax to seal the cut. Cutting the stalk: In some cases it may be necessary to cut the top healthy part away from the sick or rotting bit at the bottom of the stalk. You can try rooting the top healthy stalk by the method above, roots may appear for you after some time (no guarantee). Server responsed at: 04/21/2019 8:44 p.m.